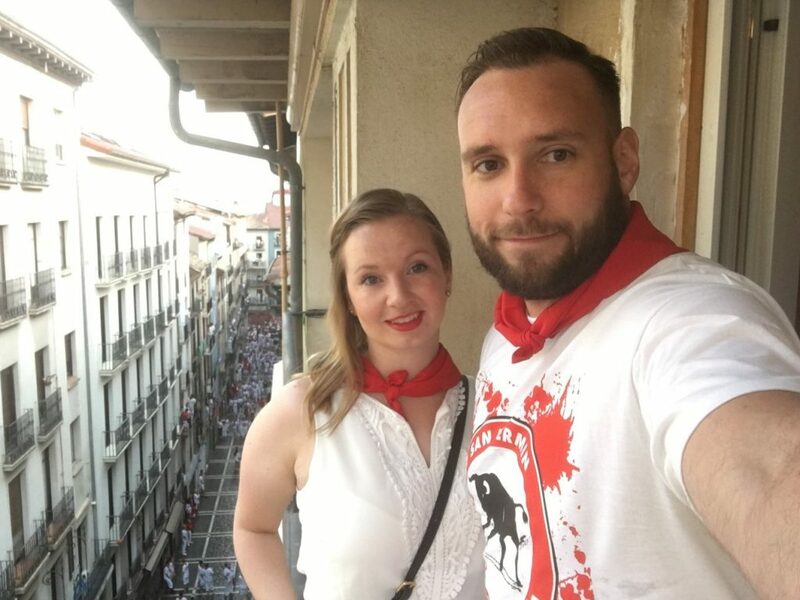 Every year San Fermin are celebrated in Pamplona, in the region of Navarra, it takes place from the 6th to the 14th of July. 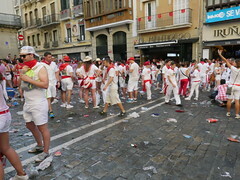 They have become internationally known because of the running of the bulls, where the bulls are lead through the streets of the old quarter as far as the bull ring by runners. 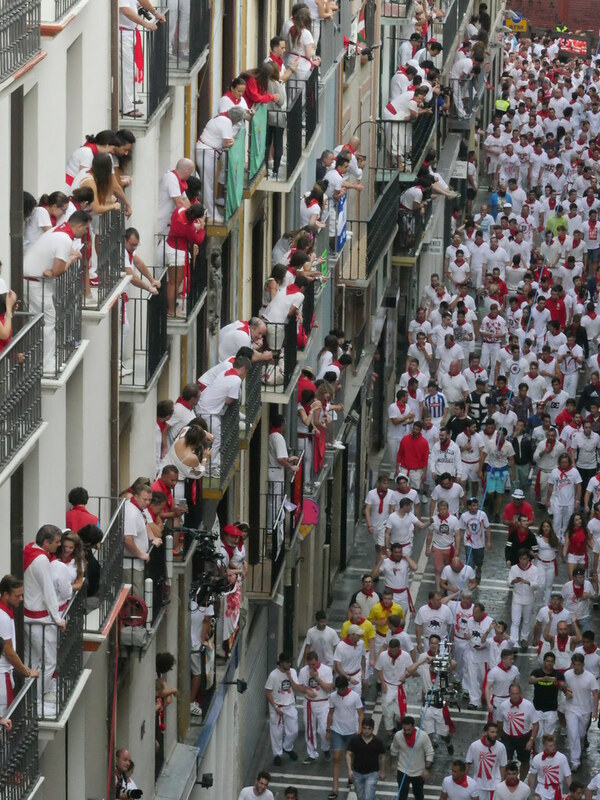 Runners come from all over the world to run or to watch others run. 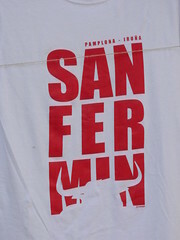 San Fermin is one of Europes biggest festivals with 1 million visitors each year. 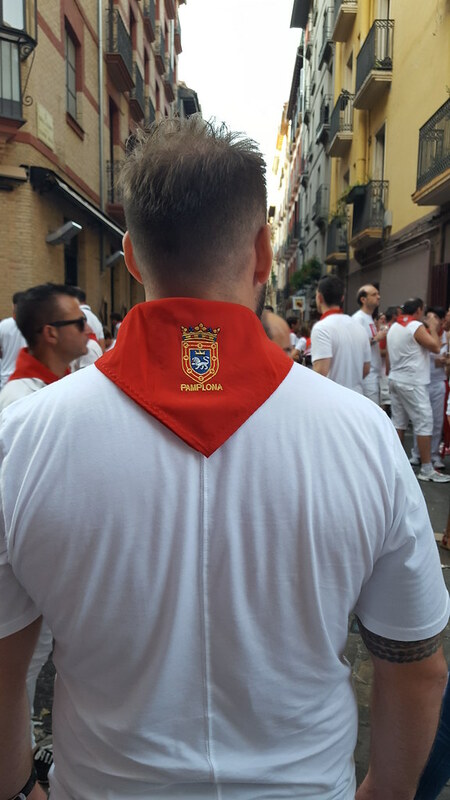 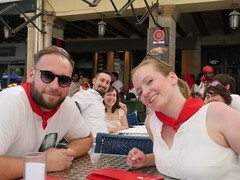 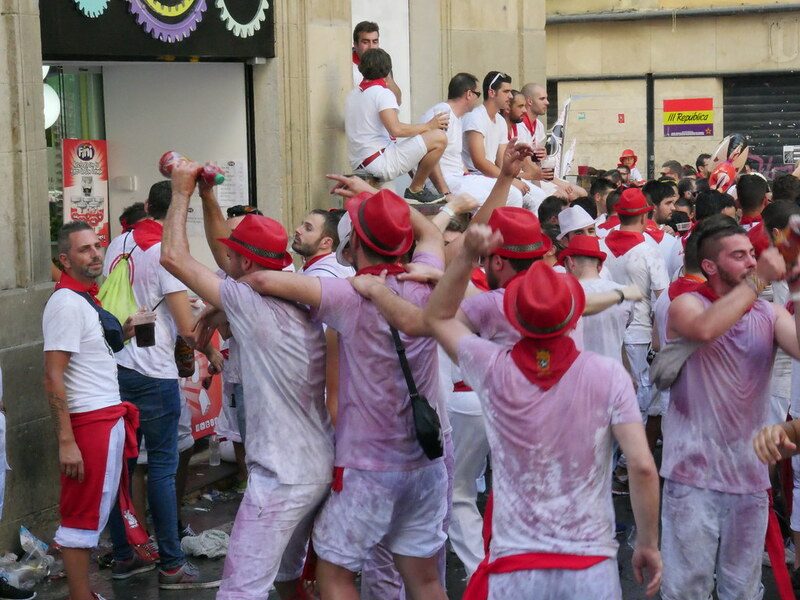 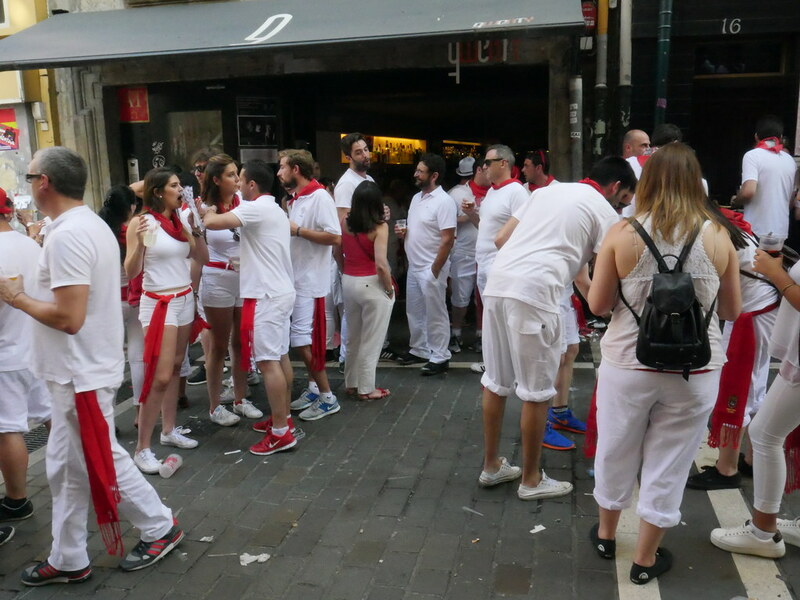 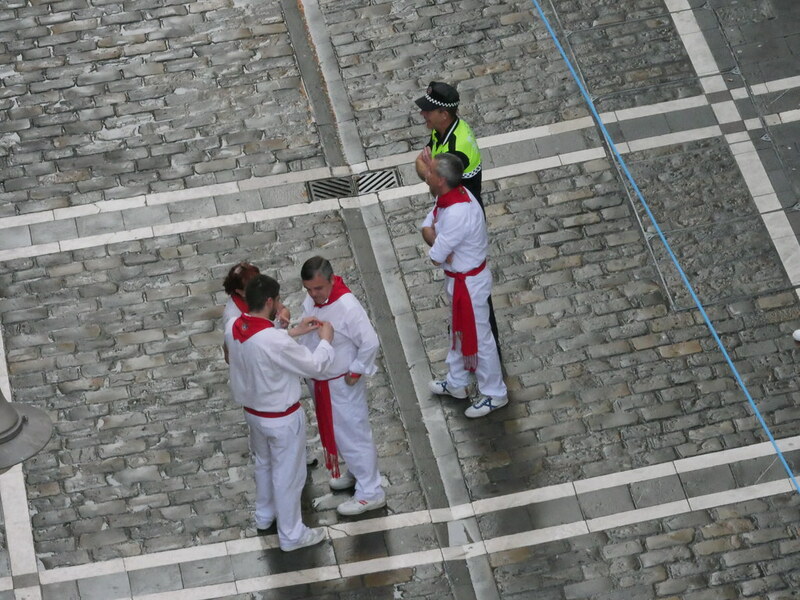 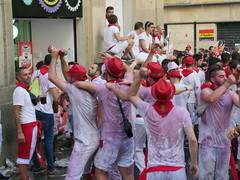 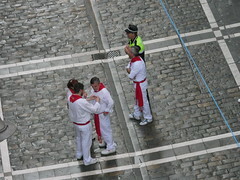 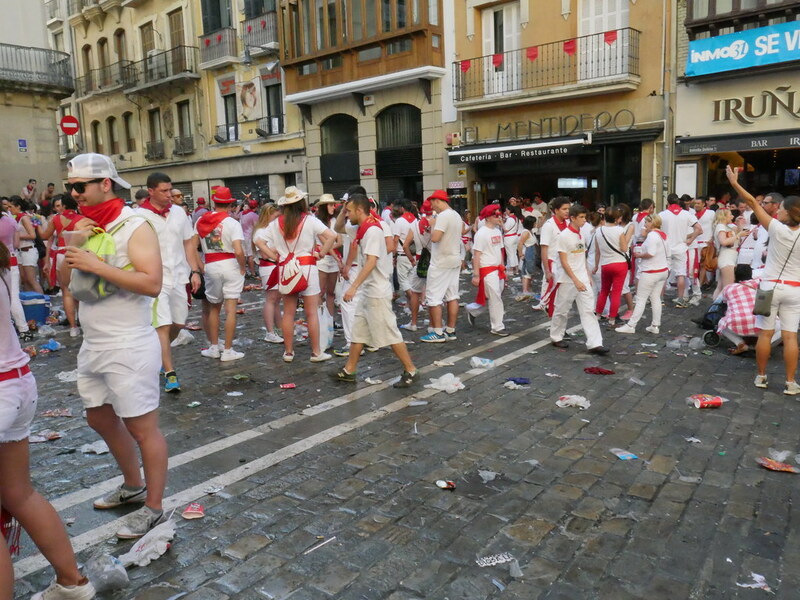 The fiestas are celebrated in honor of San Fermin , saint of Navarra, although the religious aspect would seem to have taken on a secondary role over the last number of years. 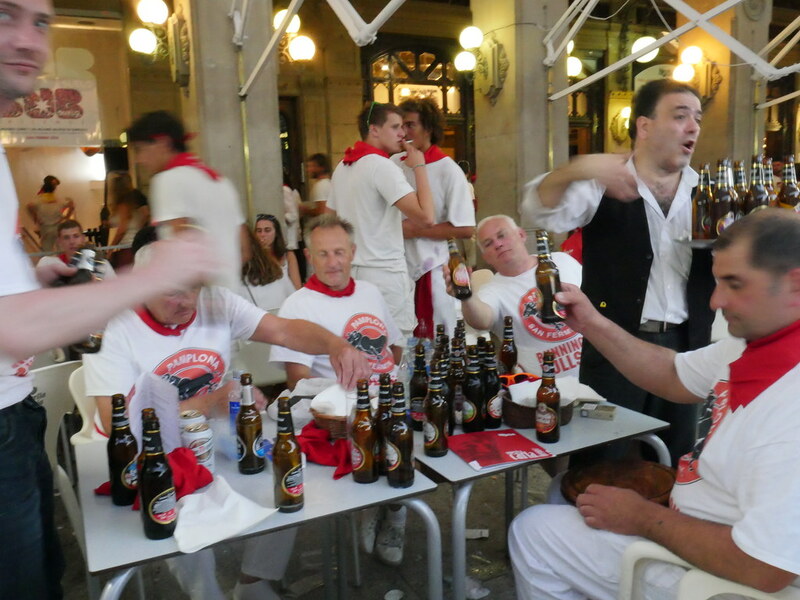 Nowadays, the fiestas are seen as a mass gathering of People, from all the corners of the world with 24 hour partys and lots of fun. 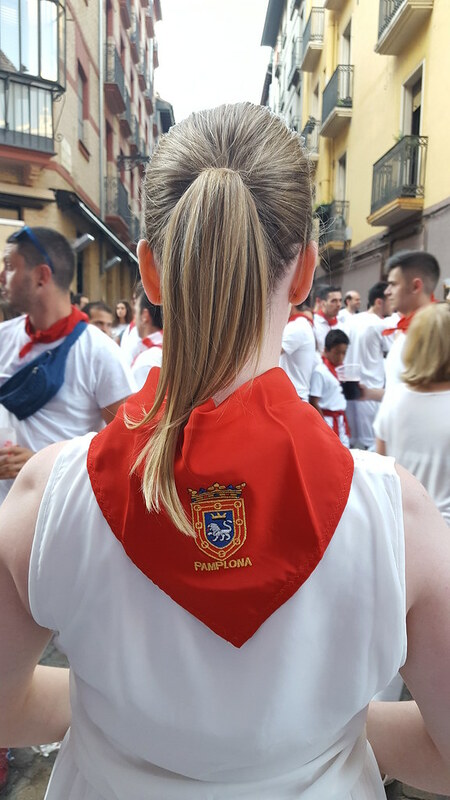 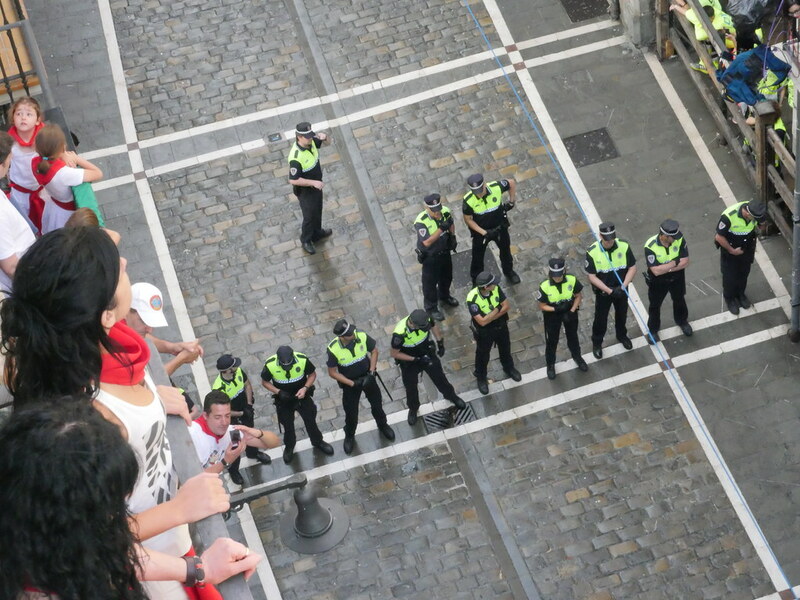 The Encierro is the event at the heart of the Sanfermines and makes the fiesta a spectacle that would be unimaginable in any other place in the world. 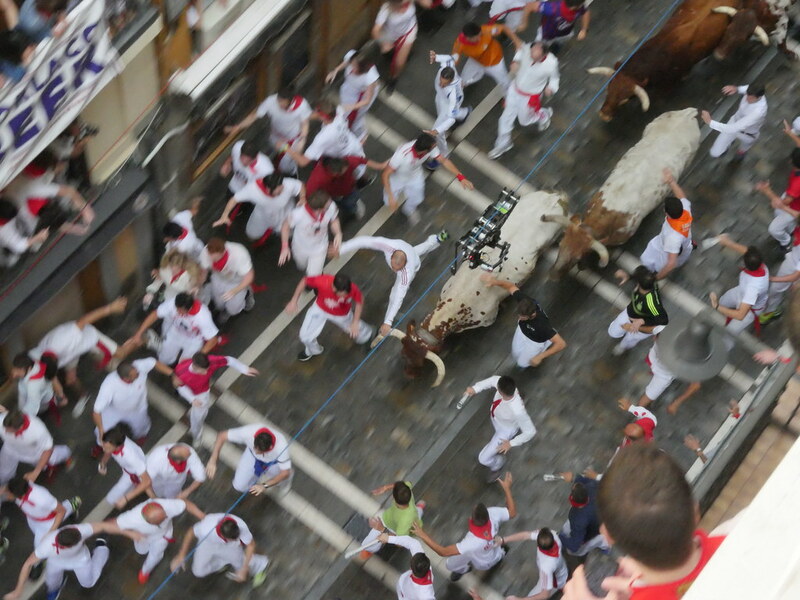 It started out getting the bulls from outside the city into the bullring. 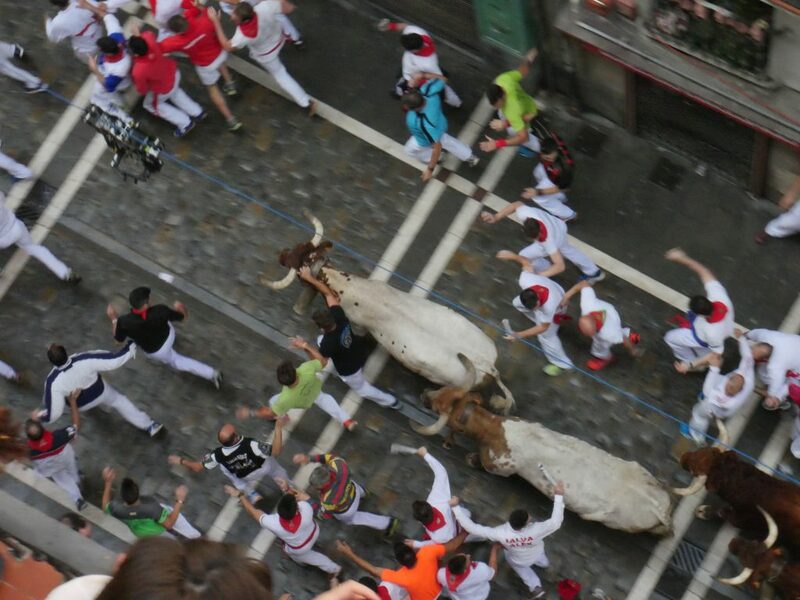 But the last decades people have runned along, in front of the bulls to test their courage. 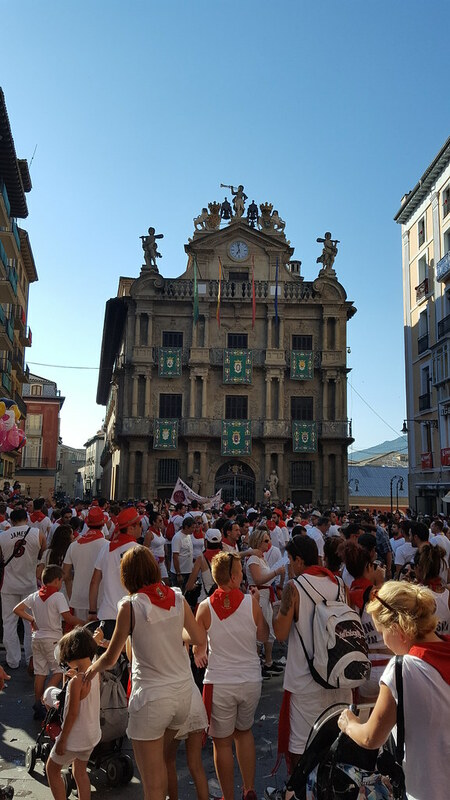 The encierro lasts 1 week and starts at the corral in Calle Santo Domingo when the clock on the church of San Cernin strikes 8 in the morning. 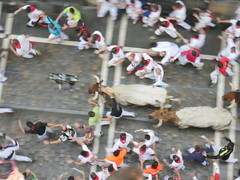 After the launch of two rockets, the bulls run behind the runners for 825 metres, the distance between the corral and the bullring. 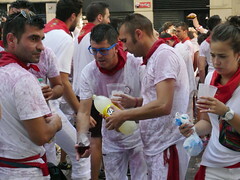 The run usually lasts between 3 to 4 minutes, although it has sometimes taken over 10 minutes. 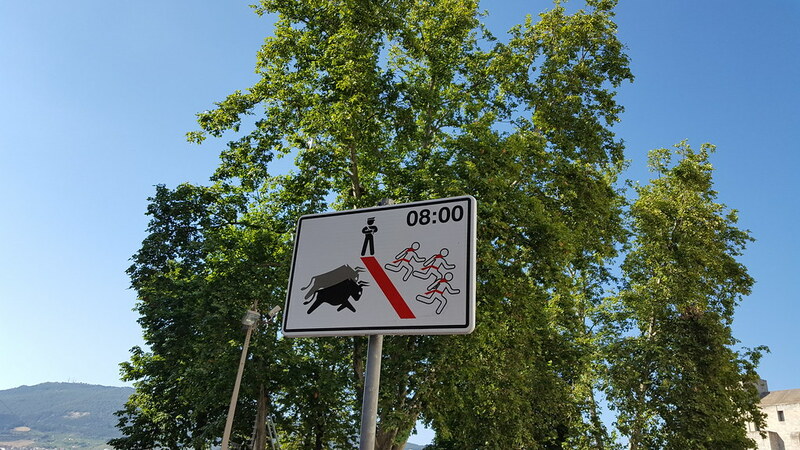 To witness the running of the bulls, its recommended to get there early, between 6 or 7 in the morning, so that you might get a spot at the fence were you see the event. 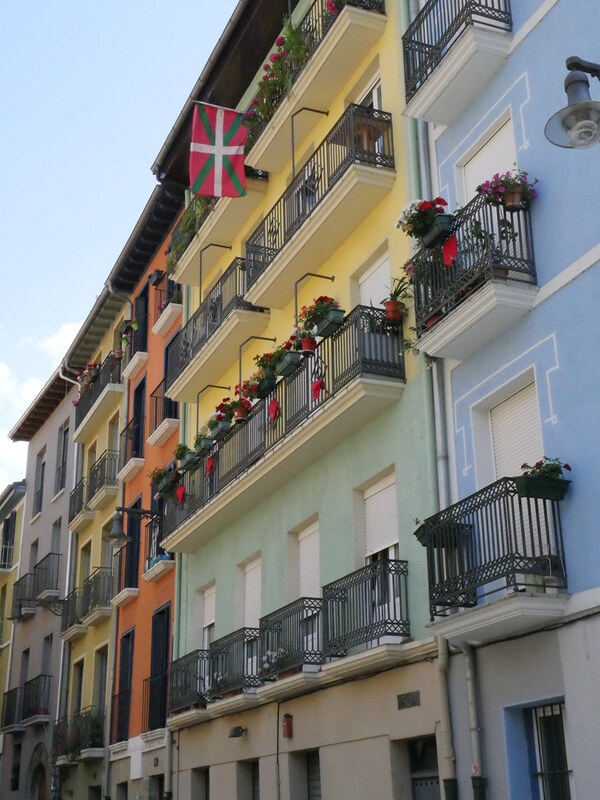 Or if you have the money, get a balcony. 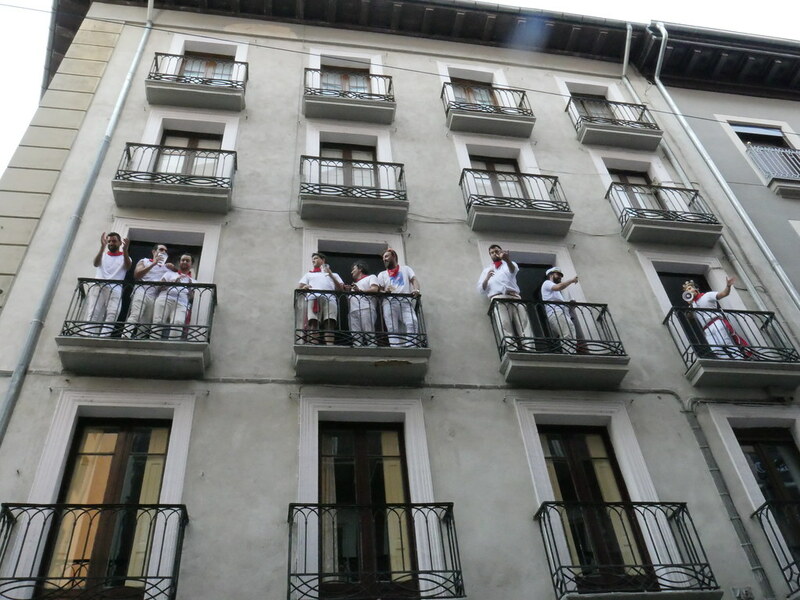 We managed to book a balcony while in Pamplona for 160 euros for 2 people. 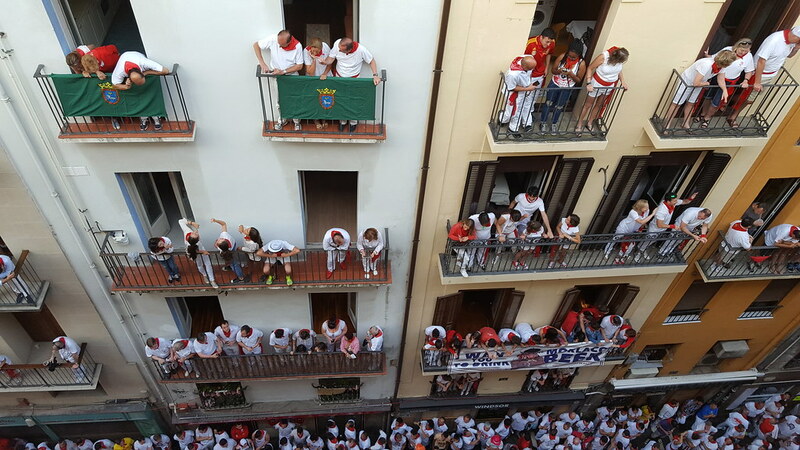 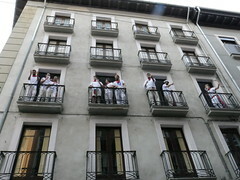 The balconies are owned by locals that live in the center of Pamplona. The morning we had booked our balcony we got there before 7, as they were closing (calle Estafeta) street after 7. 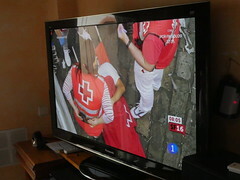 We had breakfast and then the hostes turned on the tv, where 2 channels are daily filming the bullrun. 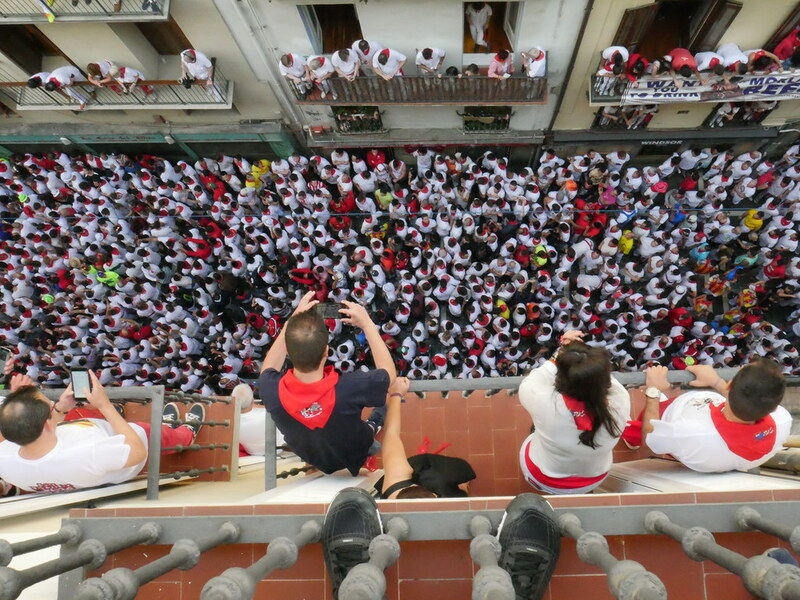 When the bullrun started we had a premium spot, overlooking Calle Estafeta watching the bulls and the thousands of people running in it. 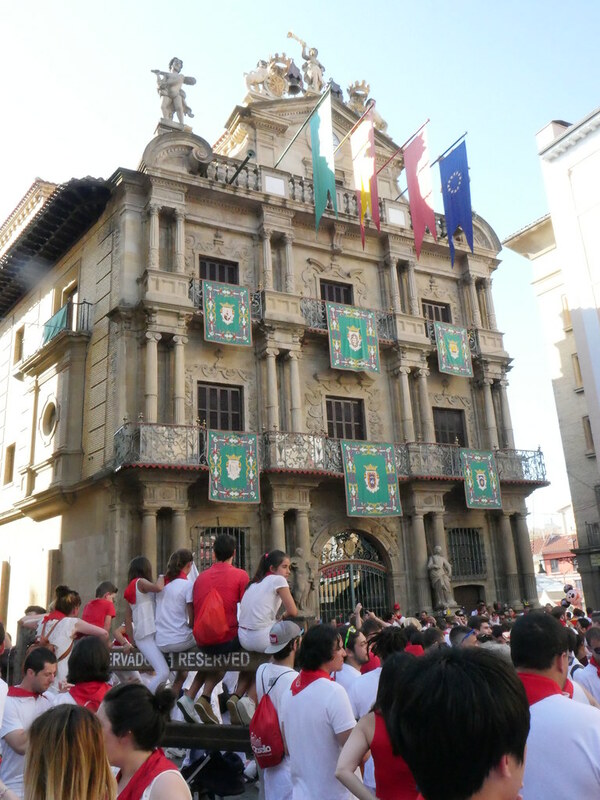 I came to Pamplona with the intention of running, and at our second day there i ran. 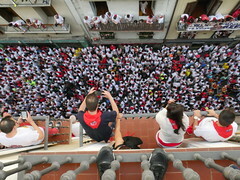 The day we had the balcony, the hostess told me i could come back the day after to stay there until the race started. The next day i went down the stairs and out into the street, giving me a lead as to where to start. 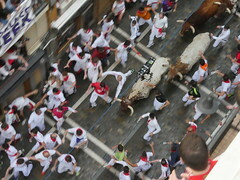 When the bulls came in the end of Calle Estafeta i ran as i never had ran before, and into the bullring. 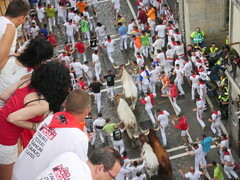 Here hundreds ran around in circles to avoid the bulls. Most bulls ran straight thru the bullring, but when all the bulls had gone thru, the organizers sent out smaller versions of bulls to run after the ones that still were in the ring. 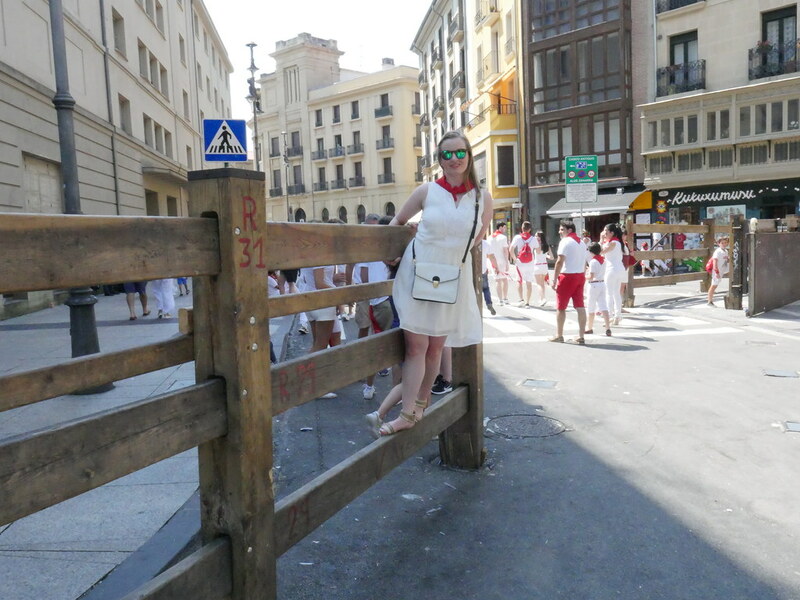 When i felt i had enough, i just jumped the fence and walked back to the hotel. 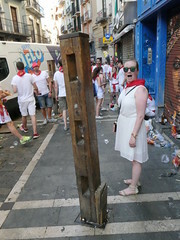 One of my sickest experiences to date. 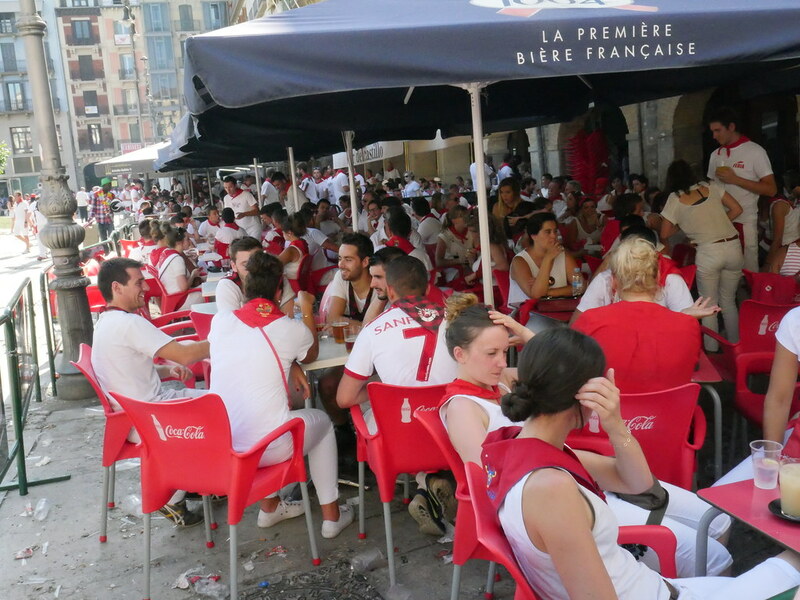 Everywhere you see, you see red and white! The temperatures down in Pamplona and the surrounding valley hit 40 during our stay, Sangria is a helping hand. When the temperatures hit 40, we need Sangria! 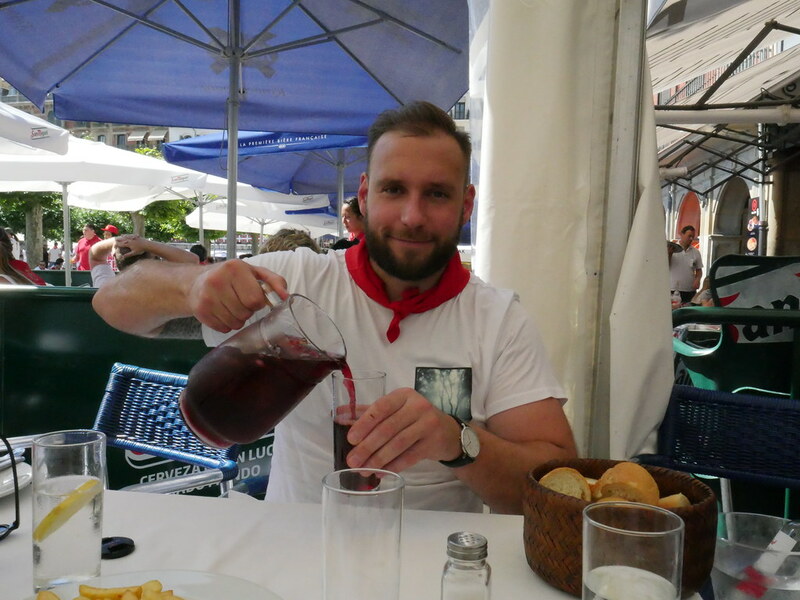 Sometimes we got to eat. 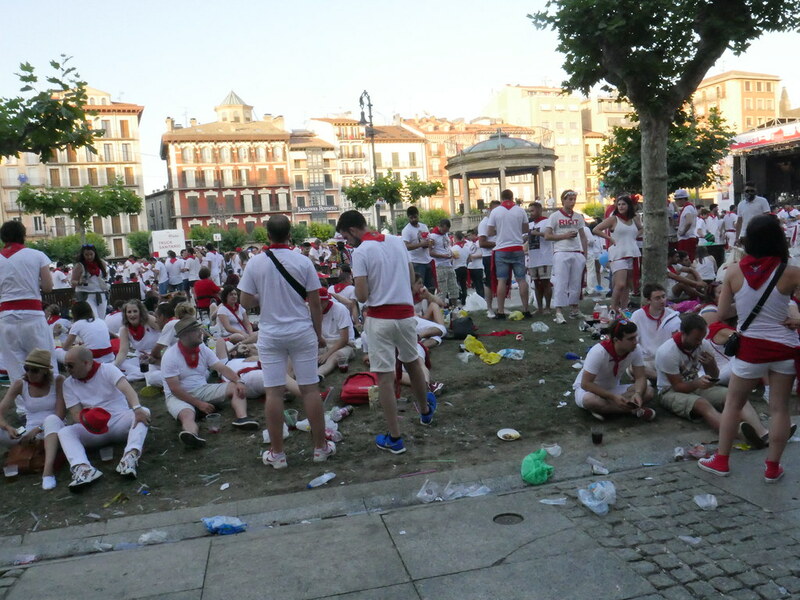 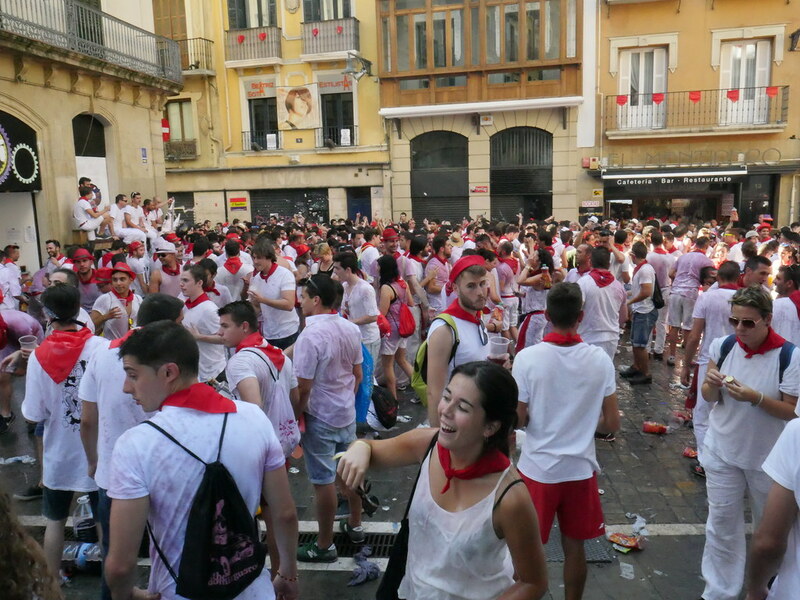 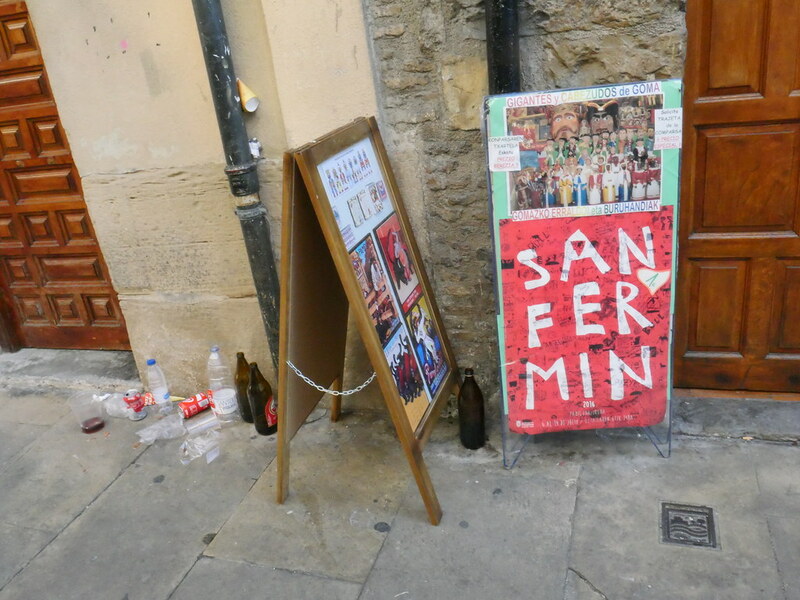 During San Fermin, sangria is dirt cheap. 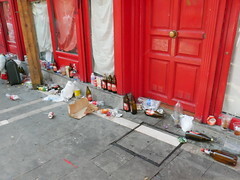 Thats why you can empty your bottle over others. 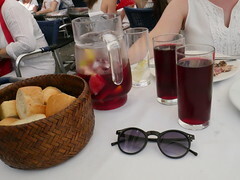 Sangria and ice, its everywhere! 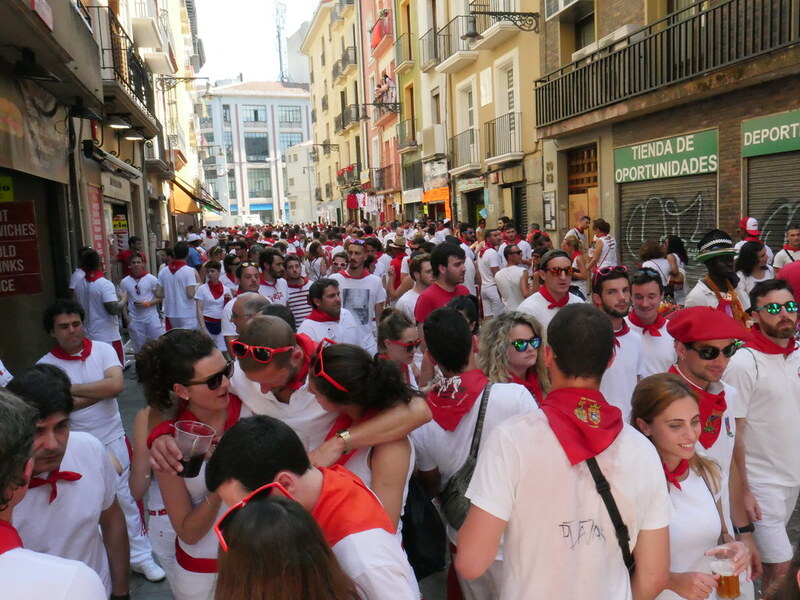 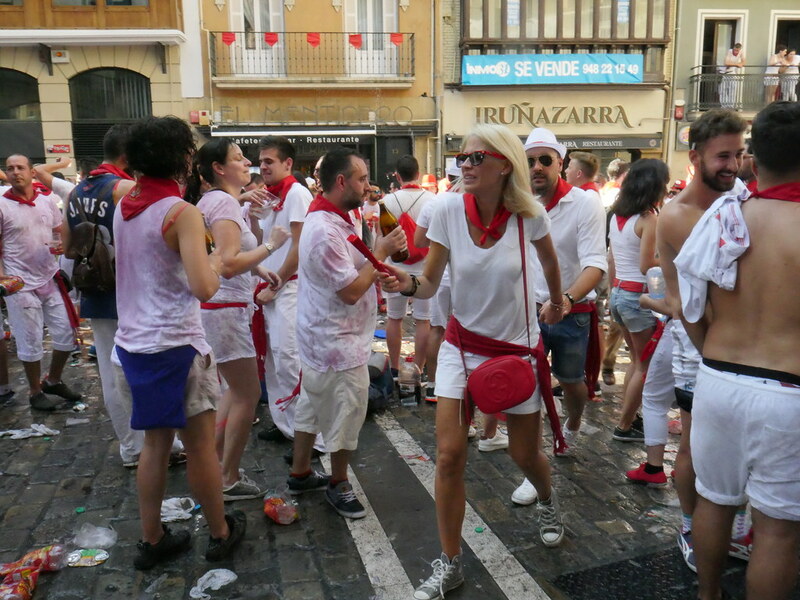 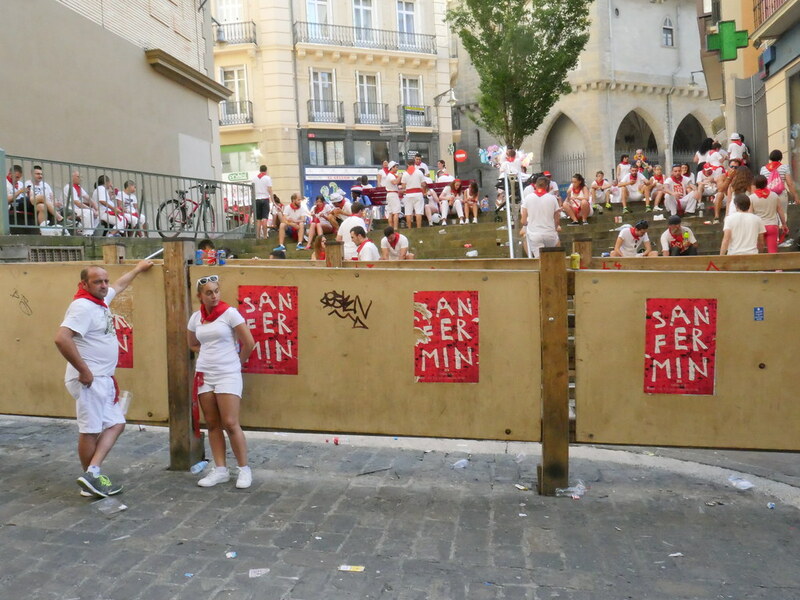 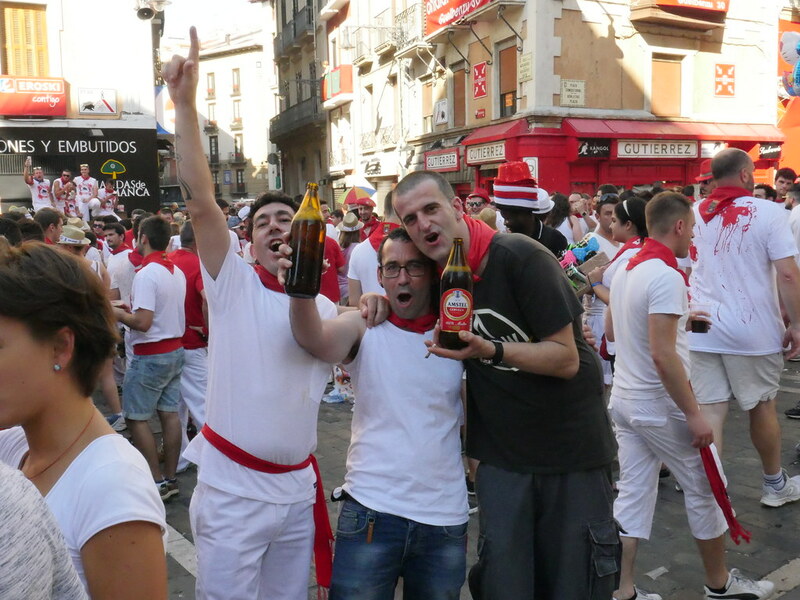 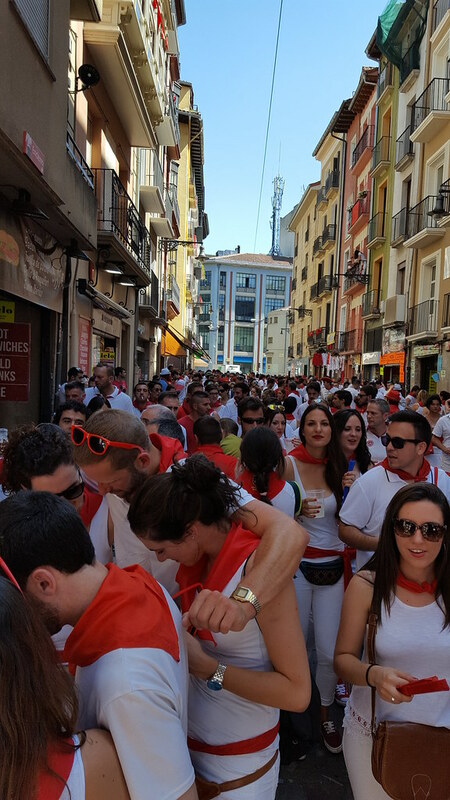 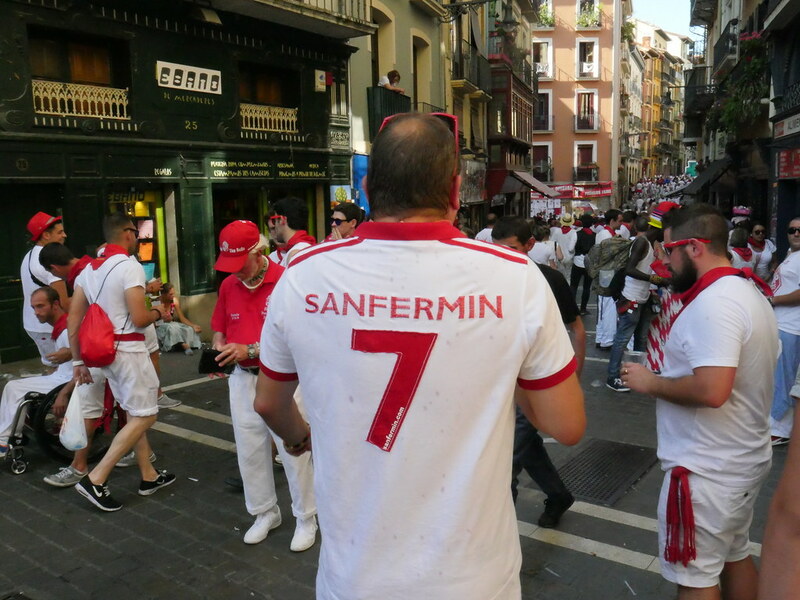 The party never ends during San Fermin! 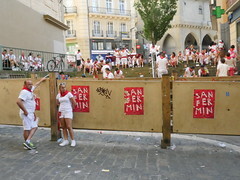 The fence are built to protect mankind. 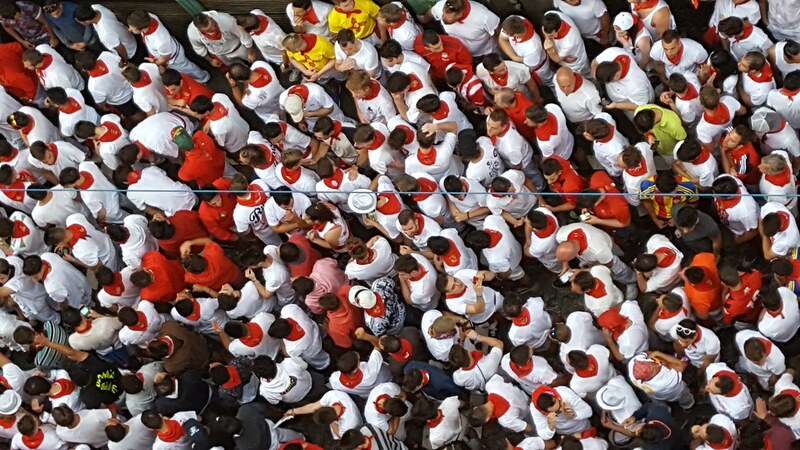 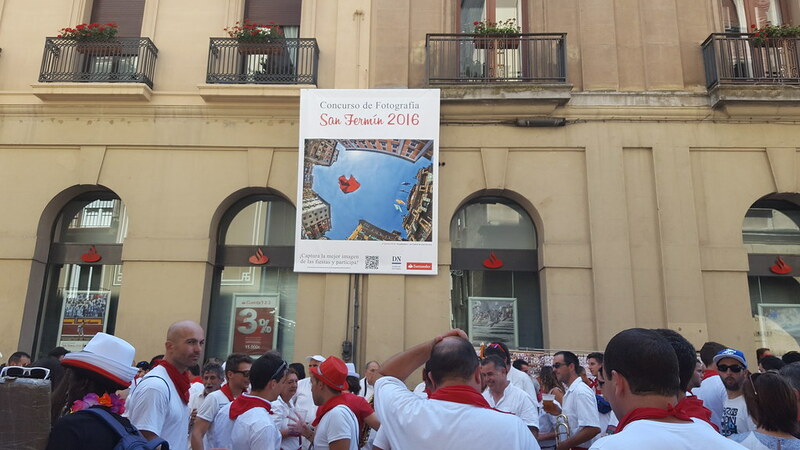 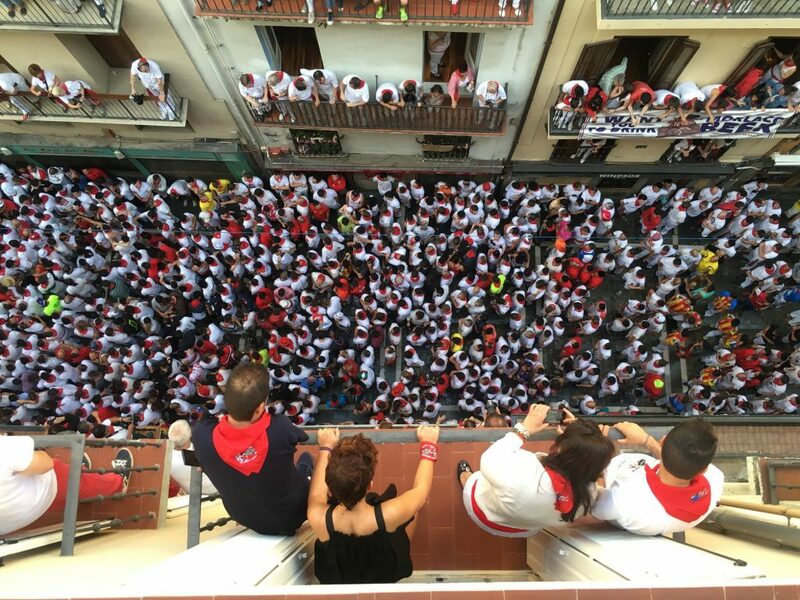 San Fermin 2016 is on! 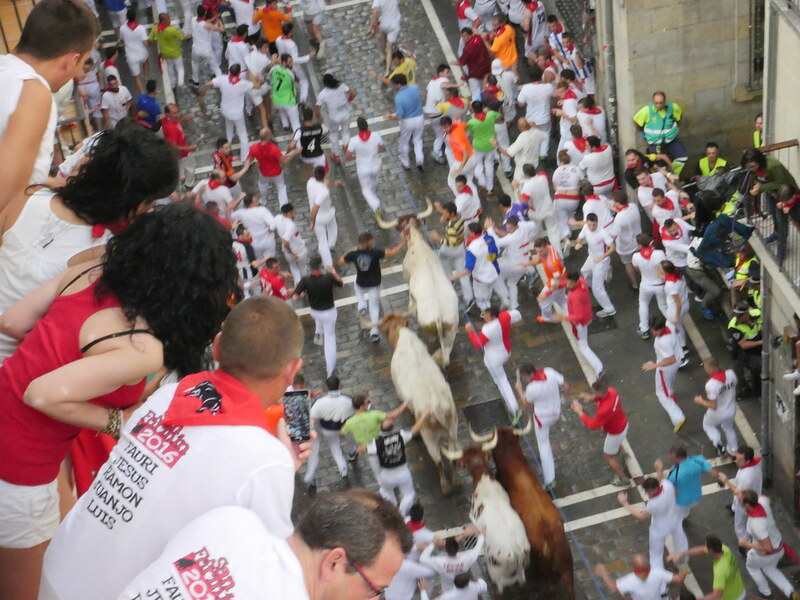 This festival is all about enjoying yourself while running or watch others run with the bulls! Rubbish is everywhere as most people just dump it on streets. 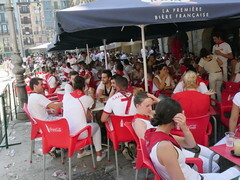 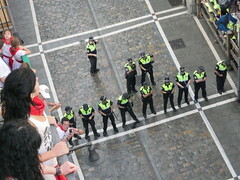 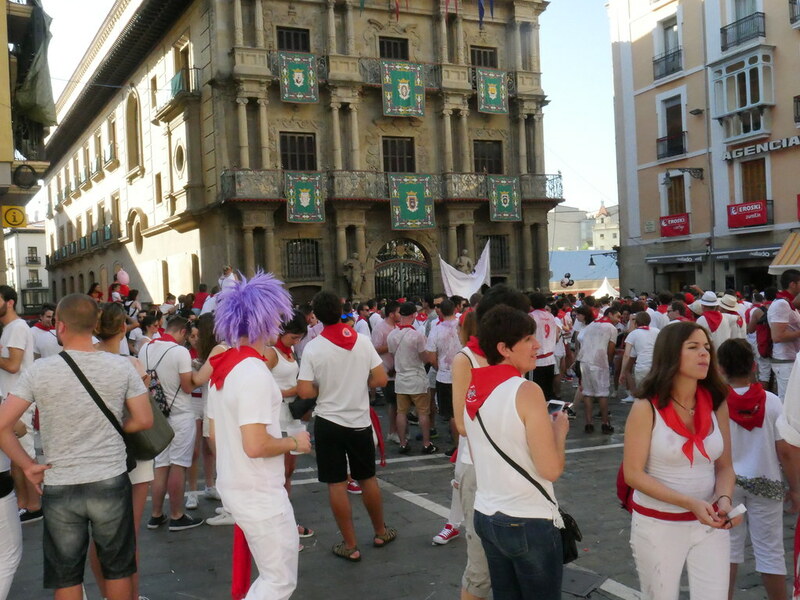 Partys are all day/all night in Pamplona during the fiesta. 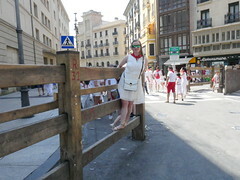 Here is some of the fence they put up when the bulls are running! 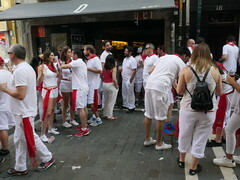 Ready to watch the bullrun! 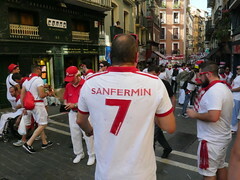 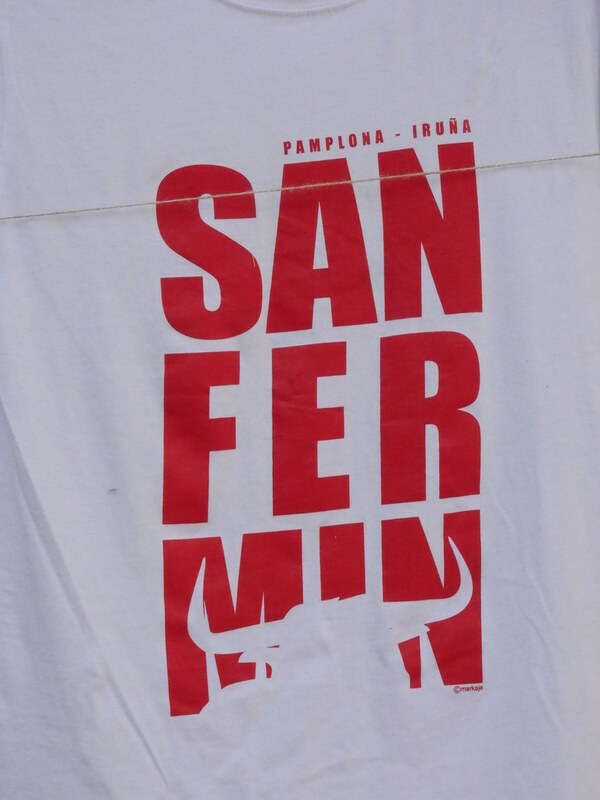 There are 1 million visitors each year at San Fermin festival. 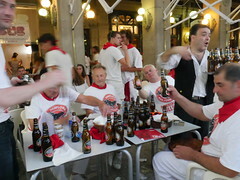 Before i took this picture, there was lots more beer on the table. 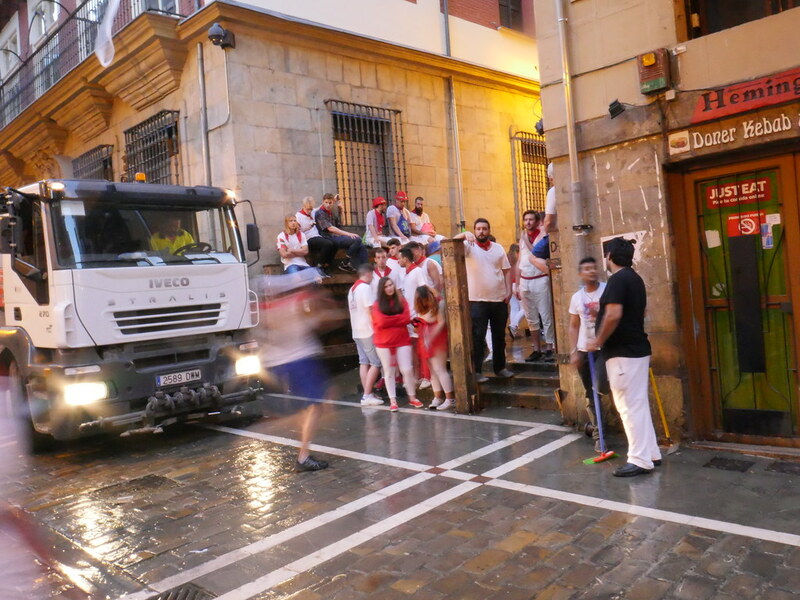 Early morning and the trucks are cleaning the streets from the night before, so that runners dont slip when running! 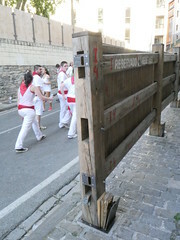 Security sees that no one starts running before the bulls are here. 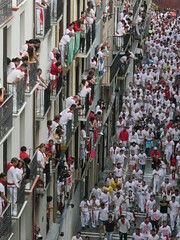 8 o clock each morning during San Ferminas, people gather to run with the bulls. 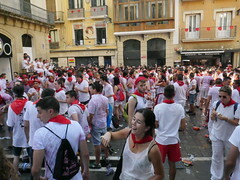 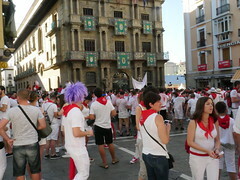 People gathering in Calle Estafeta before the bulls come. 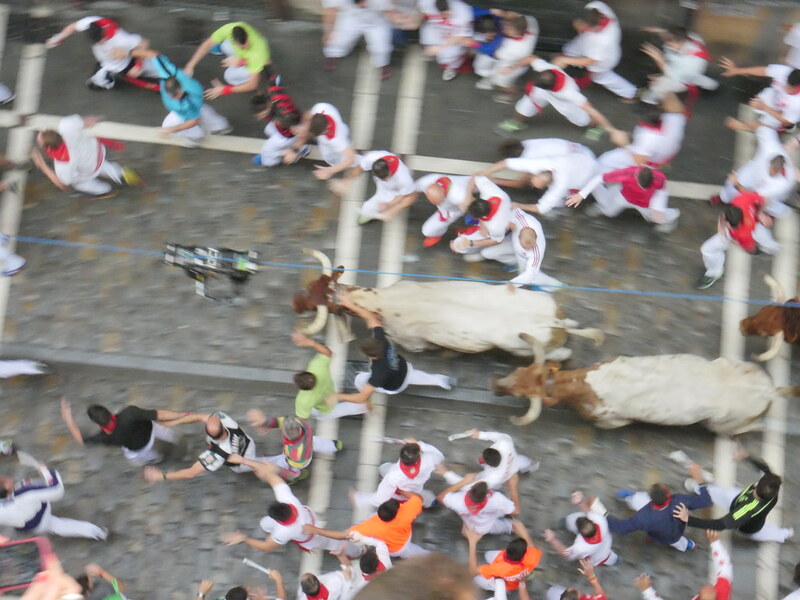 Here you see the camera just above the bull, filming close ups! 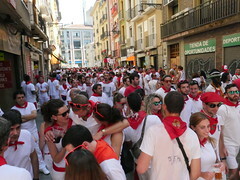 Bull run thru Calle Estafeta! As the bullrun kept going, we watched the television that people got hurt. 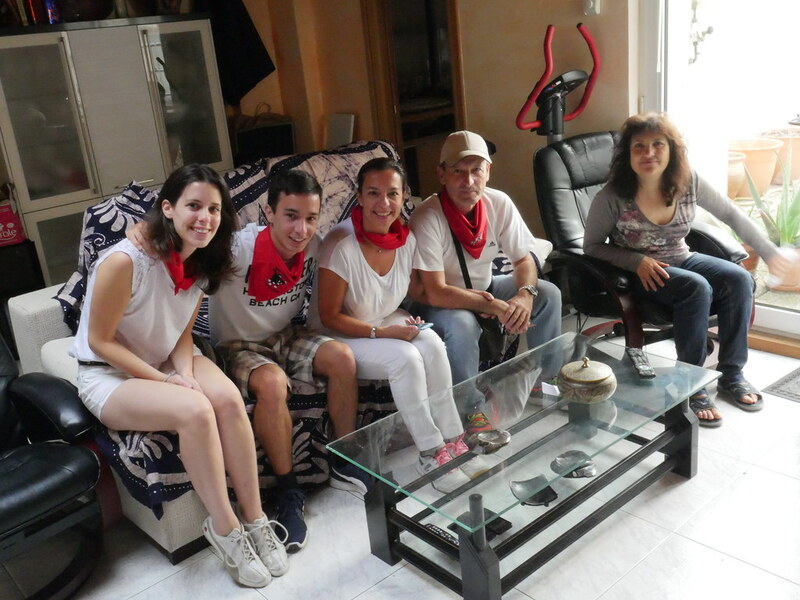 At our balcony hostes where we met another family that were planning to see the bullrun. 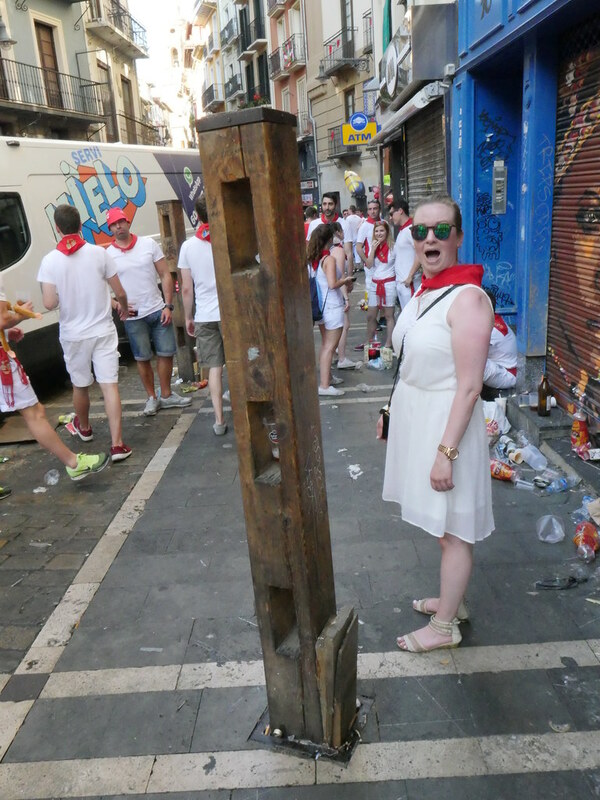 Anette trying out the wooden denne that kreps the bulls away. 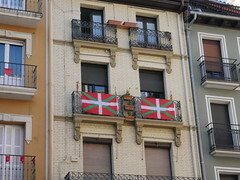 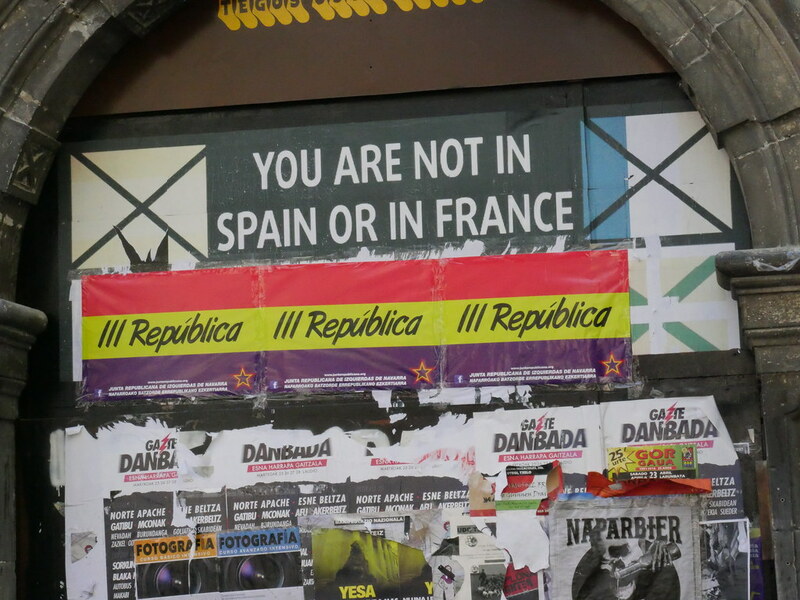 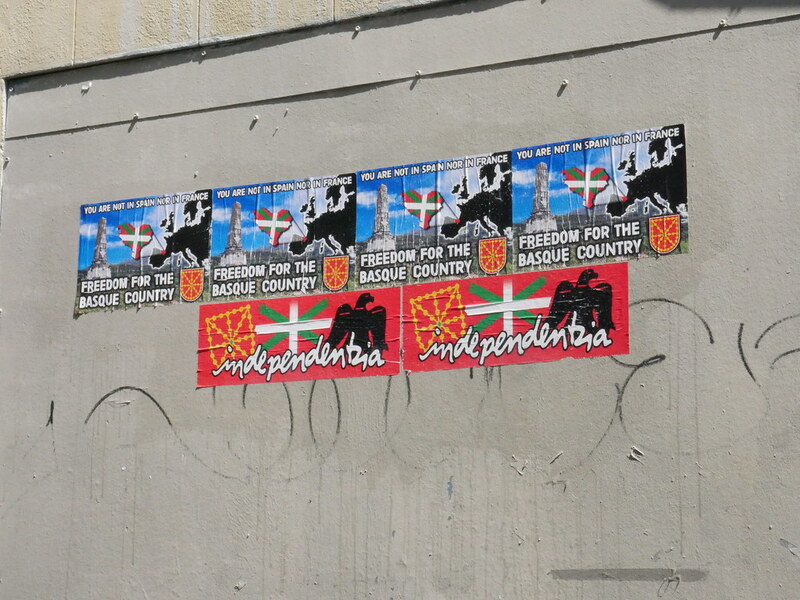 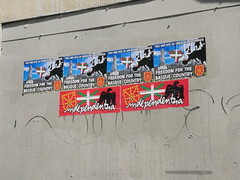 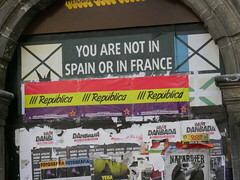 The basques like to tell the world that they're still here. 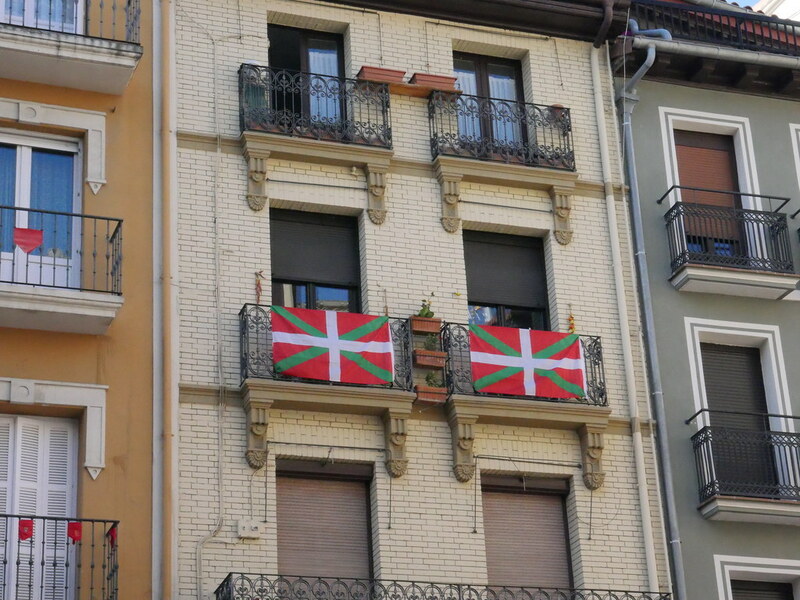 The basques are strong in their beliefes! 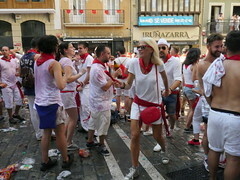 Anette ready for a fiesta! 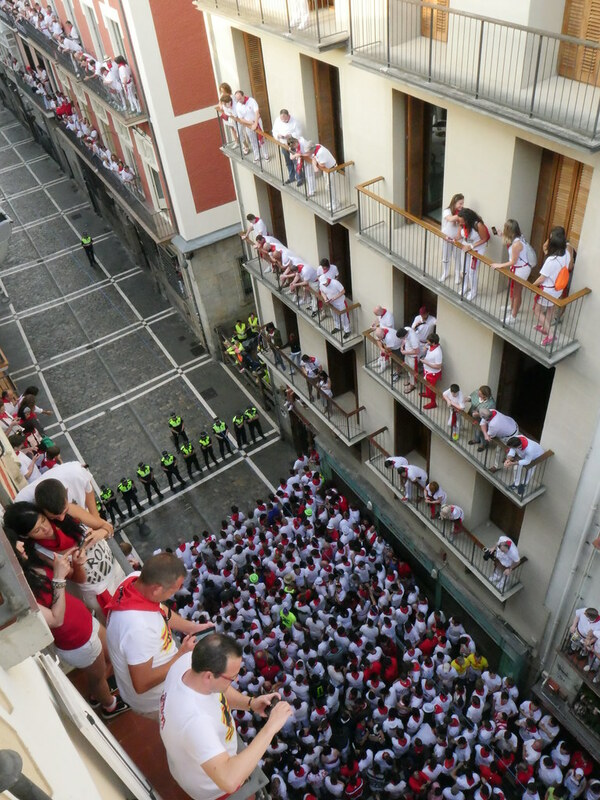 Calle Estafeta with all the balconies! 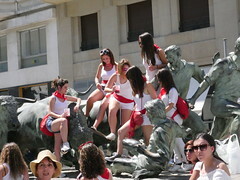 Runners before the bulls arrive.